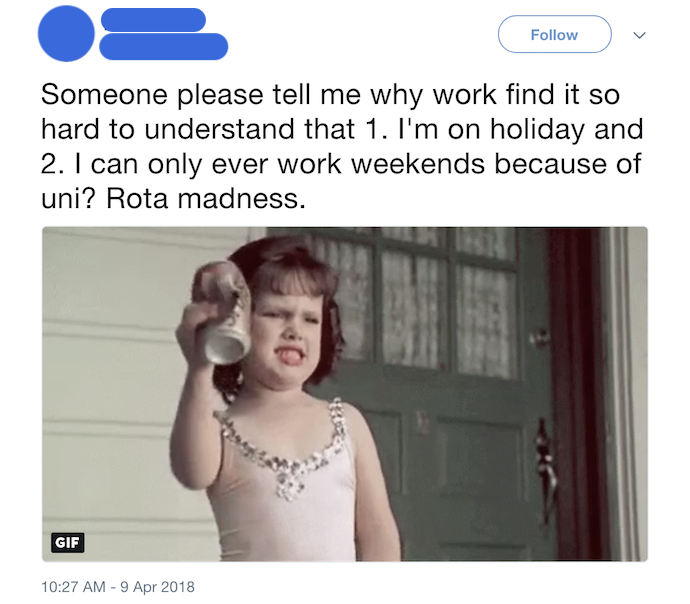 Building the rota is hard enough without having to accommodate employees' preferences for particular shifts or days off. Pretty much every member of part-time staff has the odd day or shift that they either can't or would prefer not to work, however. Perhaps they have exams to study for. Maybe they have kids to pick up from school, or have to rely on public transport and find it difficult to get to or from work at certain times. When your staff have agreed to work on a flexible rota, it can be tempting to take a 'like it or lump it' approach to planning their shifts. But ignoring your employees' requests to work — or not to work — particular shifts or days can impact not just their morale but the future success of your business. Let's take a quick look at a few instances of bosses failing to accommodate their employees' shift preferences, the effect that doing so can have, and what managers can do to strike a balance between keeping their staff happy and running their business efficiently. A quick trawl of social media sites shows just how often staff are frustrated by their managers either denying or ignoring their requests for shifts. The following is just a small sample of the complaints that staff have felt compelled to share with the world via their personal Twitter accounts. 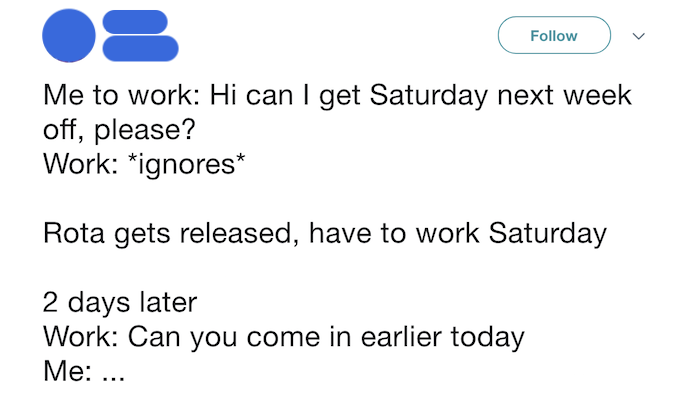 Was this employee's minor request ignored or just forgotten about? Staff are unlikely to help you out if you don't help them in return. And then there are just silly mistakes like this. The majority of staff here appear to be incredibly frustrated — either that their requests for particular days off are falling on deaf ears, or that there is no system in place for making changes between staff members to accommodate their needs. But what are the consequences of allowing this to go on at your small business? Low morale. It's hard to feel valued as an employee when your boss schedules you in for shifts that you've repeatedly told them are difficult for you — especially if the first thing you hear about it is when your name appears on the rota. You can't expect your staff to show up for work with a positive attitude if your rota negatively impacts upon their personal lives. Constant rota changes. Give your employees shifts that they simply can't work, and more often than not you'll end up having to find cover for them and updating your rota. This can lead to rota mixups between staff, missed shifts, and even legal issues as those providing cover end up working more than their contracted hours. High turnover. Ultimately, if staff become so frustrated with their manager or unaccommodating rota, then they'll jump ship the minute something else comes along. That means yet more recruitment, interviewing, and training for you to take care of. While it's impossible to please everyone on your team 100% of the time, routinely ignoring staff's requests for shifts or days off can be very damaging for your business. Especially if you're hiring for part-time positions, be sure to ask your candidates during the interview process whether they have any particular days or shifts that they mightn't be able to work due to personal commitments — and keep a log of them. As well as helping you decide whether you're a good fit for each other, this will give you something to base your rotas on should you decide to add them to your team. After all, there's no point hiring someone for a role if they won't be around when you need them! Rather than mixing shifts up every week, try to establish a pattern for your staff rotas and stick to it for several months at a time. Create a weekly, fortnightly, or monthly template, and use this as the basis for future periods. That way, not only will your staff be better able to plan their personal lives around work, but you'll have fewer last-minute requests for shift-changes to deal with every time you publish the new rota. A great many staff shift requests go unfulfilled not because managers refuse to accommodate them, but simply because they get forgotten about. Rather than relying on memory or scraps of paper, set up a formal process for your staff to follow when requesting shifts, whether it's by sending an email, filling out a form, or sending you a message on WhatsApp group chat — it doesn't matter what it is, so long as there's a clear record and process to follow. Be sure to set a deadline, ideally 3-5 days before you publish your next rota, for any requests to allow yourself enough time to consider them and plan your rotas accordingly. Make your staff a deal: you'll do your best to meet their needs regarding shifts, so long as they give you plenty of notice. If they don't, then they're expected to show up for the shifts they're given. If you decide that you'd rather let your staff trade any shifts they're unable to work than trying to build a rota based on their preferences, then it's important that you formalise the process as much as possible so that nothing is left to chance. If your staff agree to swap shifts of have another member of the team provide cover, ensure that this is documented and, ideally, signed off on by a senior member of staff and that the rota is updated accordingly. Again, you'll need to set some kind of deadline for shift swaps — for example, they must be received no less than 48 hours before the shift starts. Web-based systems like RotaCloud allow staff to communicate their availability, or request days off using an app on their smartphone. Managers then have this information available to them when planning their next rota, with the system reminding them if they're about to schedule an employee to work a shift while they're on annual leave or that they have said they might not be available for — no more mistakes or forgotten holiday requests. Staff can also use their apps to organise shift swaps between them, saving their managers tonnes of admin time. The manager simply approves or denies the proposed shift swap when the notification arrives in the system, with the rota updating automatically if the manager decides to give the exchange the green light. Like any other aspect of staff management, planning the rota is all about give and take. You expect your staff to show up for their shifts on time and ready to go, but you'll only ever get the best out of them if you bear their requests, schedules and personal responsibilities in mind when you're assigning them shifts. True, this may take up a little more of your time than simply slotting staff in for shifts willy-nilly. In the long-run, however, you'll save yourself countless hours of tweaking and updating your rota post-publication, and have a team of people who, as well as arriving at the office mentally and physically prepared to work, feel valued and respected enough to want to stick around for years to come. No business owner ever intends to be disorganised, but building a staff rota without considering the number of employees you'll really need for a given period is a recipe for disaster, often resulting in too many or too few staff being scheduled to work.